Discussion in 'Contribute' started by RHY3756547, Jun 22, 2016. So I discussed a little on the discord about what we can do differently with the new city server. The first (obviously) is to make the general lot size bigger. The new max lot size will be 64x64 buildable, right up to the path. There may be some limitations on the last 1 tile border due to terrain slope requirements (may need to count as "always sloped" as slope can be introduced by a lot move). Wow, look at all that space. Everything in the central green area is buildable. This has serious implications for roads throughout the city, specifically that they need to make sense! Lots with no adjacent roads will have NO ROAD OR PAVEMENT ON THEM, with cars and the mailbox instead appearing on a patch of dirt in front of the lot. To stop every lot looking like this, roads will be much more present in the chosen city... and since we can see the roads, they'll need to look better and have rules for intersections and joins. I've came up with 2 styles for this, but I think they could use a little work. 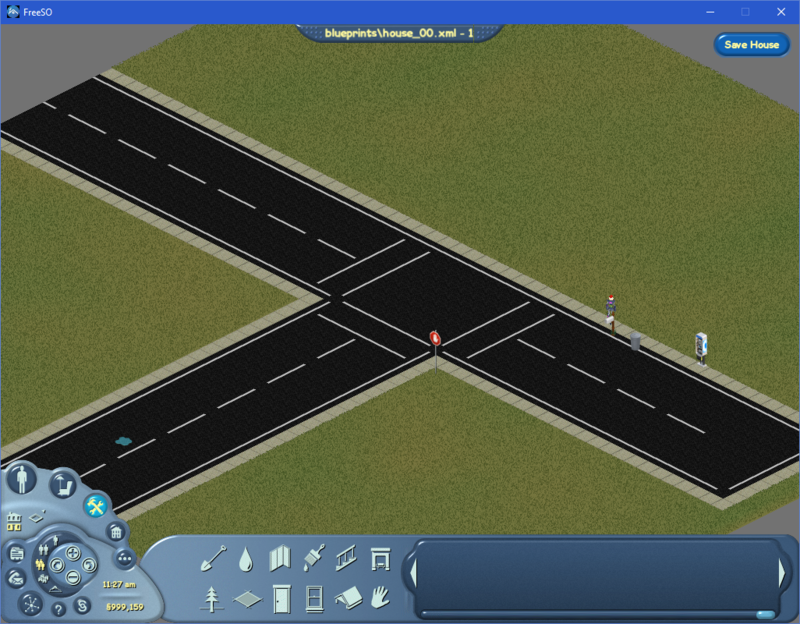 Style 1: add line boundaries to road. No grass gap. Style 1 needs a bit of development to look nicer. Feel free to SUGGEST YOUR OWN! Terrain types will be a little different. On the map you may have noticed that terrains on boundaries blends into terrain of the next type down. For everything except sand <-> water, the alive/dead grass states will be changed to represent the blend types of the underlying terrain. (alive very obviously being grass most of the time) You can see this in some of the lots in The Sims 1 on holiday island. Lots placed down will eventually respect the slope of the ground they're placed on, like The Sims 2. Our terrain tools will support placing tiles on sloped terrain, so roads can be heavily sloped too, and you can have tile paths over bumpy terrain. This wasn't possible in The Sims 1 because the ground was not 3d, and they didn't have the tech. It'll likely be a better idea to build lots on flatter surfaces, but people can build on bumpy terrain if they want to utilise it for architectural purposes. Islands will be pretty much the same. The difference is that you'll now see the open sea on all 8 sides, so it'll make it that much more worth it. They will likely be more circular or gradually sloped. Finally, it's worth mentioning that empty lots will come dotted with some trees and shrubbery relating to their terrain type, to make them a little more interesting. These will be outside the buildable area to start, but as you upgrade your lot they'll come into your ownership and you'll be able to get rid of them as you please. So, paste your thoughts, any ideas, where you think I should be going with this! zero35, zc456, mini_cooper4 and 1 other person like this. I would like to say style 1, but i think im too used to style 2.. idk. It looks all perfect! I'm a lot excited for the lots in the distance!! Style 1,for me,look perfect.. but the roads is ugly. Style 1. I don't really understand the grass gap, and I really don't see the point of it. I've only really seen them rarely around where I live and never saw a point as there is no use for the space. I'm a minimalist though, and I much prefer the simplistic Style 1. The crosswalks looks very European, I love it but not for the rest. Alessandro Needs A Server and RHY3756547 like this. 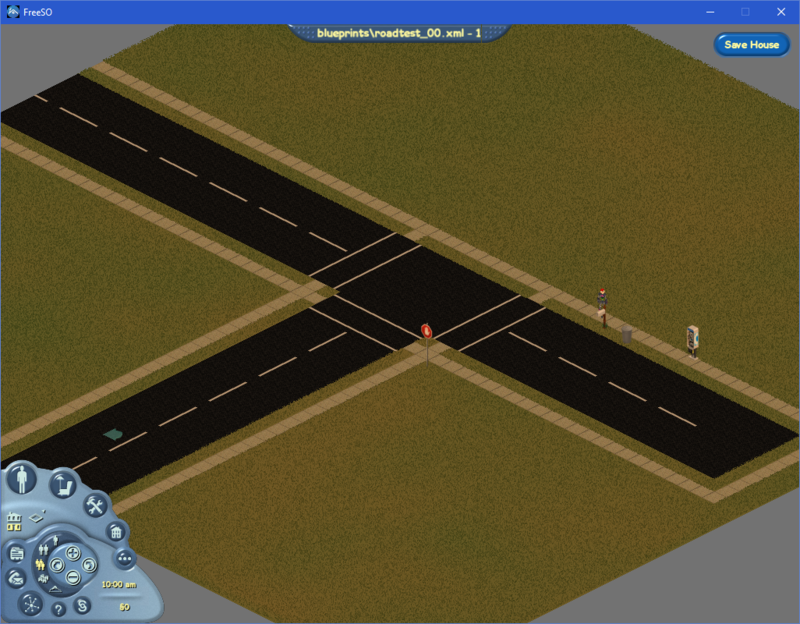 I think we could just re-design the roads to look more like SimCity 3000. I think they're prettier and we could just make them super fancy. But we need space for the Trash Bin/Pay Phone/Mail box though. The roads are too bright in my opinion. Me personally, I prefer the roads the way they are, I really wouldn't bother making them look all pretty and everything in between, as long as the game is actually working, then I feel we should start focusing on these things, but of course, I'm not developing it, regardless, I prefer Style 2. We can't just focus on the game "actually working" without a decision being made on this front, since the ramifications will be present on all lots throughout the city. Changing it later could cause complications. This is a concept. I said "like" not re-make them as I'm sure that's actually plagiarism. Simple, clean, and not-distracting is key. The roads serve such little purpose, so I don't think they need shrubbery, decoration, or too much fussing. I think style 2 achieves that nicely. Although I'm not too sure how that road layout works on a lot, with the T layout and all. I vote style 1, like many I didn't understand a grass gap between road and sidewalk. I think that the crosswalks, road itself, and sidewalks all look very familiar to me having seen similar styles irl. Overall, I am strongly for redesigning the roads to something more clean, and something that makes sense. LetsRaceBwoi and Alessandro Needs A Server like this. Style 1 is better, also i think you can use TS2 example for watching how the adjacent lots does work, doing it by isometric will be more easy, and will not requiere a lot of work, becuase those does not need to be synchronized, or they will be?? Also, just throwing an idea, the adjacent lots could be "semi-functional"